Sampai Oktober 2011, tercatat 7253 jurnals dan 658980 artikel dalam berbagai bidang dan disiplin ilmu. 3361 dari 7253 jurnal di antaranya bisa di-search sampai pada level artikel. DOAJ juga mengembangkan sarana penelusuran (search engine) untuk menelusur artikel dengan berbagai pendekatan (nama pengarang, subyek, nama jurnal, abstraks, dan lain-lain). DOAJ juga menyediakan klasifikasi jurnal berdasarkan subyek sehingga bisa dengan mudah di-browse. Australasian Digital Theses (ADT) merupakan program Department of Education, Science, and Training (Departemen Pendidikan Nasional) Australia untuk mempublikasikan thesis (baik Ph.D thesis maupun Master thesis, baik berformat digital maupun tercetak) secara online melalui Internet. Untuk memudahkan akses, program ADT membangun infrastruktur berupa database (pangkalan data), metadata, dan sarana penelusurannya (search tool). ADT bertujuan mengelola hasil-hasil riset secara lebih efektif dan mendukung gerakan open access (OA). Prinsip utama OA adalah membuka akses seluas-luasnya hasil-hasil riset dan kegiatan ilmiah lainnya (terutama yang didanai oleh public) sehingga masyarakat dunia bisa secara gratis memanfaatkan, membaca, mengkopi, mencetak, dan menyebarluaskannya (asalkan bukan untuk kepentingan komersial). Di bawah ini adalah daftar universitas di Australia dan New Zealand yang menjadi pendukung program ADT. 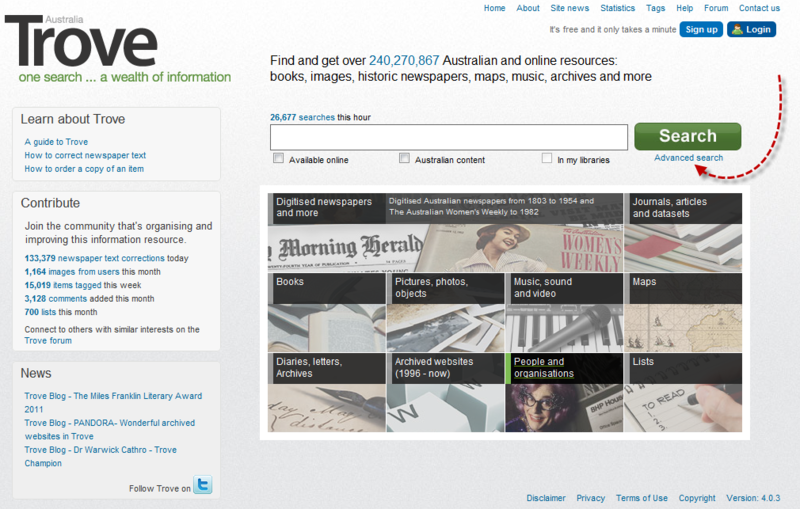 Thesis dari berbagai universitas tersebut bisa ditelusur melalui Trove, sebuah katalog induk online National Library of Australia (NLA). Menu "basic search" pada katalog online Trove. 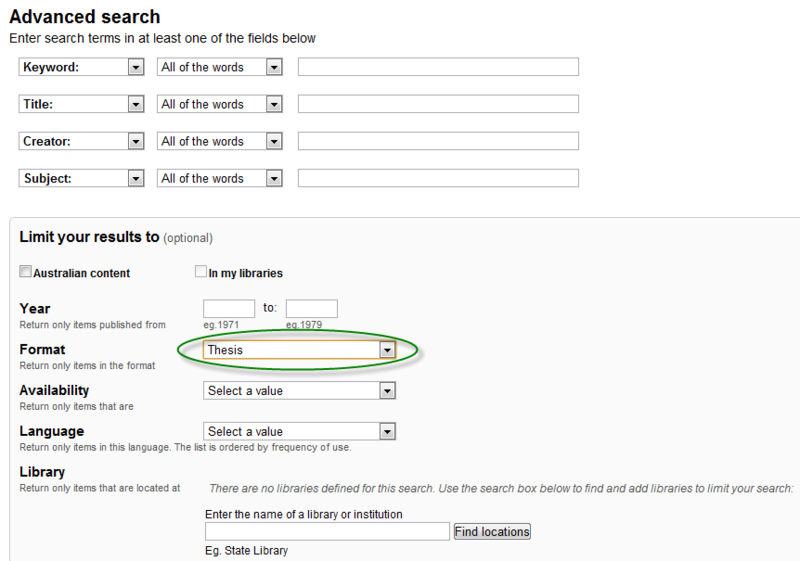 Klik "advanced search" untuk penelusuran thesis. Penelusuran individual, yaitu penelusuran yang dispesifikkan ke pangkalan data thesis satu universitas saja. Caranya:  Klik link “[search via Trove]” atau  klik link nama universitas. Detail cara penelusuran, katalog online Trove, bisa dibaca di “How to make the most of the simple search box and other features“. Selamat memanfaatkan salah satu database thesis dan disertasi terbesar di dunia yang kontributornya terdiri dari universitas-universitas besar di Australia dan New Zealand. Twitter can be classified into free social networking and micro-blogging services. It enables users to create, send and read messages known as tweets. Tweets are text-based posts of only up to 140 characters displayed on the author’s profile page and delivered to the author’s subscribers who are known as followers. Twitter entered the social networking world in 2006 and has experienced staggering growth since then. Although actual usage numbers are hard to come by, Twitter’s global unique visitor numbers have increased from 19 million in March of this year to 32 million in April (Schonfeld, 2009). Because Twitter has millions of users, it’s a good place to find and connect with people interested in any institution, company and areas of expertise. Some notable usages of Twitter are for business, social and political campaign, legal proceedings, education, emergencies, public relations, reporting dissent, and survey. In a recent feature article, Sarah Milstein (2009) makes the excellent point that Twitter is built for exchanging information. Some examples of how libraries are using Twitter include: reference service, customer service, public relations, announcement, and marketing tool. The Queensland University of Technology (QUT) Library (twitter.com/qutlibrary) uses Twitter for library announcements and news posting such as special events, holiday hours, exhibits, new book arrivals. The Ada Community Library (twitter.com/adalib) use Twitter for keeping patrons up-to-date, twittering on everything from Archaeology and Historic Preservation Month, book sales, and other library events to announcing new library cards. Twitter has become so integral a tool that several institutions—Pasadena City College’s Shatford Library, the Missouri River Regional Library, and the Undergraduate Library at the University of Illinois at Urbana- Champaign (UIUC) (twitter.com/askundergrad)—post updates directly on the library home page. In Arizona, the City of Casa Grande Library (twitter.com/cglibrary) uses Twitterfeed to post the authors and titles of new books to its Twitter profile. The service utilizes the library’s RSS feed for new titles to provide patrons with tweets concerning new acquisitions, which link back to the library’s catalog record. The Nebraska Library Commission (NLC) is using Twitter to put a new spin on its virtual reference (VR) service. NLC tweets all of its incoming reference questions as they are submitted through their Ask a Librarian service (twitter.com/NLC_Reference). Similarly, the Ask Us Now! online reference service for Maryland library patrons is also creating VR tweets (twitter.com/askusnow). ALSC, the Association for Library Service to Children (a division of the American Library Association), serves up tweets about news and events of interest to children’s library professionals such as children’s lit seminars, collection management, and special collections (twitter.com/alscblog). Many libraries believe that Twitter provides many features for marketing, promotion, collaboration, and public relations. It also provides opportunities for professional developing and networking. Twitter is not without critics. It potentially has several drawbacks with its service: its brevity, only reach certain audiences, technical problem, and spamming. Kroski, E. (2008). All a Twitter. School Library Journal, 54(7), 31. Retrieved November 3, 2009, from ProQuest Education Journals Database. Milstein, S. (2009). Twitter FOR Libraries (and Librarians). Computers in Libraries, 29(5), 17-18. Retrieved November 3, 2009, from ProQuest Computing Database. Steiner, H. (2009). Reference utility of social networking sites: options and functionality. Library Hi Tech News, 26(5/6), 4-6. Retrieved November 3, 2009, from Academic Research Library Database. Google Docs is one of Google’s services that offer free, online, and Web-based office application (word processor, spreadsheet, and presentation). This service is originated from three different products; Writely and Google Spreadsheet, and presentation product. Writely was developed by Upstrartle, Google Spreadsheet was developed by 2Web Technologies, and presentation was designed by Tonic Systems. Google Docs, which consist of word processor and spreadsheet, was made available for all users of Google Apps on February 2007 and presentation program on September 2007 (Bodis, 2007). Google Docs represents the core pattern four of Web 2.0, rich user experience. It combines the best of desktop and online experiences. Google Docs provides features that the desktop application has, for example high versatility, great GUI (graphical user interface), user friendliness, and fast performance. Through the strengths of the Internet, Google Docs enriches users with collaborative actions to deal with their documents. At the same time, multiple users can share, open, edit, tag, and archive their documents both for individual or organisational purposes. By default, the documents are saved to the Google servers and revision histories are automatically kept. These features deliver the ubiquity of access to the documents. Google Docs also employs the principle of prioritising usability and simplicity as one of the best practices. In terms of usability, Google Docs enhances the compatibility of file format with other standards, for instance the ISO standard Open Document (.odt, .odp, .ods) and standard of proprietary formats (.doc, .ppt and .xls) (Google, 2009a). Thereby, it can eliminate file format compatibility issues. It is obvious that Google Docs always add some new features as it can be seen at New features in Google Docs (Google, 2009b). The challenge for Google Docs in providing new features is to ensure that the new features should be ‘bandwidth friendly’ that can still be accessed throughout the world, in particular in developing countries that still have inadequate internet infrastructure. Other challenge is concerning privacy and data security issues. It has ever reported that unintended access to private document has ever occurred (AFP, 2009). Google Docs services can also improved by increasing size limits. The size limits is explained in Getting to know Google Docs: Size limits (Google, 2009c). Facebook is a free-access social networking website that is operated and privately owned by Facebook, Inc. In Februari 2004, it was founded by Mark Zuckerberg with his fellow computer science major students and his roommates Dustin Moskovitz and Chris Hughes while he was a student at Harvard University. In line with the best practices covered in this pattern, in its commencement, Facebook seemed to employ the best practice of ‘scale with demand’. Facebook, in its early development, was designed to start small and scale with demand. This is reflected in its membership. Initially, the membership was restricted to students of Harvard University, and subsequently expanded to other US and Canadian colleges then to European and Asian colleges (email addresses with .edu). Since September 11, 2006, it has been available for any email address globally (Fabernovel Consulting, 2007). Facebook claims that its general growth has reached more than 200 million active users with more than 100 million users log on to Facebook at least once each day (Facebook, 2009). Syndicating business model also has become Facebook strategy. It can be seen from one of its revenue model. Facebook lets Microsoft provide search and advertising listings to its users. Thereby, Microsoft is able to post advertising banners and sponsored links that appear on the left or the bottom of Facebook pages. Facebook also can benefit from the Microsoft adCenter system, which allows advertisers to filter their targets so that their ads are relevant. The provision of outsourced infrastructure is undertaken by Facebook through developing Facebook Platform which provides a framework for developers (anyone) to create applications that interact with core Facebook features (Facebook, 2007). The platform was launched on on May 24, 2007. According to Facebook (2009) there are now more than 660,000 developers and entrepreneurs from more than 180 countries and more than 52,000 applications currently available in the Facebook Application Directory. From the abovementioned fact, it can be considered that Facebook has employed some best practices of the pattern eight, lightweight models and cost-effective scalability. Etsy.com is a P2P ecommerce company website which provides the general public with a way to buy and sell handmade items, including art, photography, clothing, jewelry, and toys. By limiting sales to handmate items, Etsy has defined smart focus on a niche market that can potentially gain the long tail effect. As it can be seen from the fact, only two years after its establishment June 18, 2005 by iospace, a small company composed of Robert Kalin, Chris Maguire and Haim Schoppik, Etsy has grown significantly to tens of thousands of sellers and five times that in buyer accounts. In November 2007, buyers spent $4.3 million purchasing 300,000 items for sale on Etsy, an increase of 43 percent from October 2007 (Walker, 2007). The abovementioned success of Etsy in gaining a significant number of producer and buyer is driven by Etsy’s mission, which is to enable people to make a living making things, and to reconnect makers with buyer (Etsy, 2009). This mission reflects the democratisation of production and distribution as suggested by best practice of this pattern, ‘build on the driving forces of the long tail.’ Through Etsy, everyone can produce his/her works and market them with low cost. One of best practices reflected by Etsy is that, Etsy seems to develop open architecture of participation by frequently adding new tools and functionality to the site to help sellers gain exposure and traffic, including a taxonomy of categories with tags, and blog. These two features can capitalize on the wisdom of crowd that is generated by user product reviews and popularity ranking. Another best practice implemented by Etsy is that, Etsy provides customers a feature to manage their own account to ensure that customer can gain greater control. The challenge that could be encountered by Etsy is that how to develop a system and policies that can assist sellers and buyer to avoid fraud. Although Etsy has stated that they have no control over the quality, safety, morality or legality of any aspect of the items listed, the truth or accuracy of the listings, the ability of sellers to sell items or the ability of buyers to pay for items, however they have to ensure users the safety and convenience of transactions.